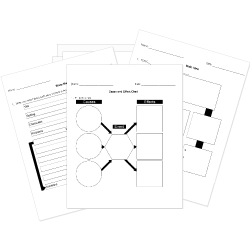 You can create printable tests and worksheets from these Grade 6 Character Study questions! Select one or more questions using the checkboxes above each question. Then click the add selected questions to a test button before moving to another page. What are the descriptions given by the author about the characters in a story such as personality, habits, likes and dislikes called? What type of characters are Penguin, Jafar, and the Big Bad Wolf? The teacher asked Kaley what the answer was to the math problem written on the board. Kaley showed a worried expression on her face for a moment, and then put her head down on her desk. After the teacher moved on to someone else, Kaley whispered to her friend that the answer was 26. Kaley had the right answer to the math problem. What character trait does Kaley demonstrate? Fill in the name of your character in the circle. Identify two traits of that character and write those traits in the square. In the bottom rectangles, provide a quote or example of each trait. Craig is a football player training over the summer for next season. The coach demands that all players come in at 6:00 AM and lift weights until 8:00 AM. Craig gets there at 5:00 AM to begin his training. What character trait does Craig demonstrate? Chloe came back from the restroom and noticed that her rainbow pencil was missing from her desk. She looked around the classroom and saw that Beth was using a rainbow pencil that looked just like hers. Chloe started crying uncontrollably and ran out of the room. What character trait does Chloe demonstrate? The protagonist is the character against the hero of the story. Rocky's cousin brought him to a party. Rocky didn't know anyone at the party. Shortly after getting there, Rocky's cousin disappeared. Rocky made a lot of new friends at this party and had a great time. What character trait does Rocky demonstrate? After Mark's mechanical pencil ran out of lead, he asked Pete, who sat next to him, if he could borrow a pencil. Pete yelled, "No, Mark! If you didn't come prepared, why is that my fault? Bring TWO pencils to class! You can't have one of mine or you'll never learn your lesson." What character trait does Pete demonstrate? Choose the word that describes how Makayla feels. Makayla said, "Oh dear. The wagon is broken. Now I don't know how we will get these pumpkins to town." Jonathan invited a bunch of friends over to his house. He then talked to them for hours about all the trophies that he had won, his rare comic book collection, and how much money his dad makes. His friends did not enjoy their time at Jonathan's. What character trait does Jonathan demonstrate? What happens in the story's resolution? Everyone who tries out for the play wants to act in it. The auditorium is filled with the words in Sayaka's play. Sayaka's father lets her know that he is ready to listen. The curtain is lifted and My Own Wings begins playing. Anna volunteered to help Kylie clean her house. When Anna washed the mirrors, Kylie asked her if she used paper towels instead of newspapers. When Anna admitted that she had, Kylie asked her to redo them. Then, while Anna was sweeping, Kylie corrected her on her technique. "Don't just push the dirt around, Anna. SWEEP it," Kylie told Anna. What character trait does Kylie demonstrate? Choose the word that describes how Hunter feels. Hunter said, I'll do anything I can to fix this wagon for you." Which action shows that a character is athletic? What might a character do to show a love of animals? Scott doesn't talk much in school, but five girls in our homeroom class are currently competing for his attention. This is nothing new. Girls have liked Scott for as long as I can remember. What character trait does Scott demonstrate?